Although most smokers are aware of the harmful effects of smoking, this may not be enough to overcome the reasons why they are smoking. A careful review of these reasons may help them come to the conclusion that it is time to quit. How many people look back at the end of their lives and think "I'm sure glad I was a smoker" or "I really regret giving up smoking"? Now is the time to begin taking action and getting the help necessary to break this habit. You'll be glad you did. Smoking is associated with significantly increased overall morbidity and mortality. This was recognized early in the era of industrialized cigarette production and mass use. In the 1950s there were already reports linking cigarette smoking with the fast rise in the rate of lung cancer. Today, knowledge of the negative health consequences of smoking is widely recognized, but smoking still remains the number one cause of preventable death in developed countries. Tobacco smoke is a dangerous substance with more than 500 known cancer-causing chemicals. Every time a smoker lights up he or she is being injured to some degree by inhaling these poisons. Lung cancer is presently the number one killer in both men and women; in the year 2000 some 300,000 people died from lung cancer in the United States alone. Among smokers aged 35 to 69, smoking accounts for a threefold increase in the death rate. Approximately half of all regular smokers that begin smoking during adolescence will be killed by tobacco (WHO). In 1985 it was estimated that more than one in every six deaths in the USA was the result of smoking. Smokers have more acute and chronic illnesses than those who have never smoked, more bed-ridden days, and more days missed from school and work. Smokers make greater use of inpatient and outpatient hospital services and lower use of preventive care services. Of all cancer deaths in the US, 30% could be prevented if cigarette smoking were eliminated. Cardiovascular disease is the leading cause of death in developed countries, and smoking is considered one of the major risk factors in its development. Coronary artery disease (CAD), cerebrovascular disease, abdominal aortic aneurysm, and peripheral vascular disease are all caused by smoking. The degree of this risk is proportional to the amount of cigarette smoking. Cigarette smoking exacerbates both the frequency and duration of ischemia in patients with CAD. Furthermore, in patients continuing to smoke within 3 weeks of receiving thrombolytic therapy after a myocardial infarction, the risk of reinfarction increased from 5.1% to 20% compared to smokers who quit. Smoking is the single most important risk factor for the development of large vessel peripheral vascular disease. This is mediated through smoking induced atherosclerosis and vasoconstriction. Smoking is associated with atherosclerosis of the aorta, and death rates from ruptured abdominal aortic aneurysm (AAA) are higher in smokers: 59% of all aortic aneurysm is the result of smoking. The death risk of AAA is two to three times higher in smokers as compared to never smokers. Smoking causes an acute increase in blood pressure, pulse rate, plasma ACTH, cortisol, aldosterone, and catecholamine levels. The irritant and inflammatory effects of tobacco smoke lead to increased cell turnover, damage to cells and tissues in the throat and lungs, and interference with the normal barrier and clearance mechanism of the lung. The loss of the protective cilia allows harmful smoke particles, dust and bacteria to invade the lungs... thus reducing resistance to lung diseases. Studies have indicated that smoking is the primary risk factor for accelerated decline in respiratory function. For instance, "forced expiratory volume in one second" test (FEV1) is an often-used measurement of lung function. FEV1 normally declines with age, but while in nonsmokers this decline is some 20-30ml per year, in current smokers this decline is 25-80ml per year. Combined exposure to asbestos and cigarette increases the relative risk of developing lung cancer five-fold over smokers not exposed to asbestos. Tobacco-initiated DNA damage can also be amplified by exposure to other toxic agents, such as asbestos or alcohol. Smokers of all ages are more likely to report pulmonary symptoms such as chronic cough, phlegm production, wheezing, and shortness of breath. Studies have found that smoking is associated with an increased rate of acute respiratory infection. Furthermore, mortality from influenza and pneumonia is increased and this increase is directly proportional to the amount of cigarettes smoked. Overall, smoking is responsible for 82% of chronic lung disease. The best form of treatment for this is to quit smoking; antibiotics help, as does exercise. 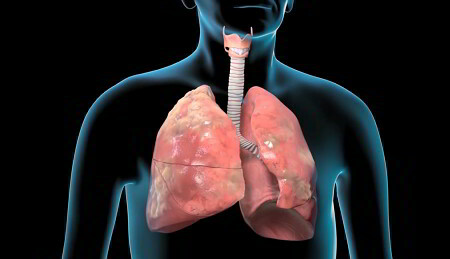 A lung transplant could be required in extreme cases. Smokers who have children, particularly children with asthma, may have another compelling reason for kicking the habit. Unknowingly, they could be contaminating their children's bloodstream with a major nicotine metabolite called cotinine, while damaging their children's bronchial function in the process. Shockingly, cotinine levels were nearly 10 times higher in children of parents who smoked more than half a pack of cigarettes per day, with the mother's smoking habits having by far the greatest impact on the child's cotinine levels. The higher the level of cotinine in the child's urine, the worse the child's bronchial sensitivity. Other childhood diseases are more prevalent amongst children whose parents smoke. For example, a child with parents who smoke is estimated to be at 30 times greater risk of developing leg-hip Perthes disease. A study of 132 pairs of twins (264 subjects) showed that smoking can have negative effects on the endocrine system, causing a 3- to 5-fold increase in the risk of all types of thyroid disease. The association was most pronounced in autoimmune disorders (Graves' disease and autoimmune thyroiditis), although there was still a strong association for non-autoimmune thyroid disorders. A study at the University of Bergen in Norway, reported October 28th, 2003 in the journal Neurology, found that smoking can more than double a person's chances of developing multiple sclerosis. The risk was higher even if people had given up cigarettes. The authors, Dr. Trond Riise and colleagues, examined 22,312 people aged between 40 and 47. Of those, 87 had MS. The smokers were 1.81 times more likely to get MS than the non-smokers and men had a higher (2.75 times more likely) risk than women (1.61) who had smoked. Smoking is the cause of Buerger's disease: there is no documentation of occurrence in nonsmokers, implicating cigarette smoking as the primary cause. Recent work suggests that Buerger's disease may be a reaction to tobacco of persons with a specific genetic type or an autoimmune disorder with immune cell sensitivity to some collagen types, which are constituents of blood vessels. Smoking causes cerebrovascular disease primarily by increasing atherosclerosis and thrombosis. Between 50% and 55% of all strokes in the United States are directly attributable to cigarette smoking. A smoker is 1.5 to 3 times more likely to develop cerebrovascular disease. Cigarette smoking is the most important risk factor for vascular disease bar none. According to a report from the U.S. Surgeon General, "Cigarette smoking should be considered the most important risk factor for coronary heart disease." Statistical evidence reveals a three- to five-fold increase in the risk of coronary artery disease in smokers compared to nonsmokers. Risk of dying from a heart attack or stroke depends the number of cigarettes smoked, the number of years smoked, the age of smoking onset and depth of inhalation. However, when a woman stops smoking, no matter how long or how much she smoked, her risk of heart disease drops by 50% in the first year alone. Similar benefits would be expected for a man. Malignant hypertension and renovascular hypertension are more common in people who smoke. Approximately 15% of hypertension is attributable to smoking. Smoking interferes with the metabolism of multiple anti-hypertensive medications, neutralizing their effectiveness. Tobacco smoke contains more than 4,000 chemicals, more than 50 of which have been identified as carcinogens. These chemicals are extremely damaging to the cardiovascular system. Specifically, these chemicals are carried in the bloodstream on LDL cholesterol, where they either damage the lining of the arteries directly or they damage the LDL molecule which then damages the arteries. High cholesterol levels compound the risks. Smokers have on average 33% more angina attacks than do non-smokers. Smoking delays wound healing by weakening the immune system and reducing oxygen levels. The risk of being diagnosed with cardiomyopathy goes up with the number of cigarettes smoked per day. Although there is room for controversy, all doctors recommend that smokers with DCM quit smoking. Studies have shown that tobacco use may be one of the most significant risk factors in the development and progression of periodontal disease [Journal of Periodontology, May 2000]. Put simply, smokers' teeth fall out faster than those of non-smokers. A 2013 study published in the Journal of the American Dental Association found that postmenopausal women who smoked were much more likely to experience tooth loss than women who didn't. Women who smoked two or more packs per day and women with the heaviest pack-years of smoking increased their chances of losing a tooth due to periodontal disease (PD) by 7 to 10 times. Some of the substances in tobacco reduce the body's ability to fight infections such as PD, and both smoking and PD contribute to bone loss: The weaker your jawbone, which supports and anchors teeth, the more likely your teeth will loosen and even fall out. Smoking or chewing tobacco can reduce saliva production. Smoking is associated with the development, delayed healing and recurrence of peptic ulcers, as well as resistance to treatment. Tobacco smoking is the most important single source of cadmium exposure in the general population. It has been estimated that about 10% of the cadmium content of a cigarette is inhaled through smoking. The absorption of cadmium from the lungs is much more effective than that from the gut, and as much as 50% of the cadmium inhaled via cigarette smoke may be absorbed. On average, smokers have 4-5 times higher blood cadmium concentrations and 2-3 times higher kidney cadmium concentrations than non-smokers. Despite the high cadmium content in cigarette smoke, there seems to be little exposure to cadmium from passive smoking. No significant effect on blood cadmium concentrations could be detected in children exposed to environmental tobacco smoke. Women who smoke may be 50% more likely than nonsmokers to develop cervical cancer or precancerous lesions. Smoking can lead to a weakened immune system, making colds, flus, and many other ordinary illnesses worse than otherwise. The evidence is overwhelming: smoking boosts bone loss and is therefore a risk factor for osteoporosis and for bone fractures in general. If you smoke or are around damaging fumes (such as those in certain kinds of factories), you are more likely to get acute bronchitis and to have it longer because your bronchial tree is already damaged. Smoking is a risk factor for the development of pneumonia. Smoking increases the risk of a collapsed lung. Lung cancer is the leading cause of cancer death among both men and women. Some 90% of lung cancer in men and 79% of lung cancer in women is directly attributed to smoking. In fact, smoking increases the chance of developing lung cancer 22-fold for males and 12-fold for females. The relative risk of developing lung cancer is directly proportional to the amount and duration of smoking. The 250% increase in the occurrence of lung cancer between 1960 and 2000 followed the rise in cigarette smoking 20 years earlier. Smoking causes lung cancer of all the principal histologic types: squamous cell, large cell, small cell and adenocarcinoma. Small cell cancer is the most aggressive type of lung cancer and has the worst prognosis. This kind of cancer tends to grow rapidly spread to other parts of the body early. Large cell cancer spreads to lymph nodes of the chest and it enters the blood stream where it gets carried to other organs such as the liver, bone, brain, and spinal cord. Among men there is an increased proportion of squamous cell carcinoma, while in women there is an increased proportion of adenocarcinoma. Smoking is the major cause of this cancer with approximately 82% of cases attributed to it. The risk of developing laryngeal cancer is approximately 10-fold greater for a male and 8-fold greater for a female as compared to never-smokers. The risks are directly proportional to the number of cigarettes smoked. People who stop smoking can greatly reduce their risk of developing cancer of the larynx, as well as cancer of the lung, mouth, pancreas, bladder, and esophagus. Nearly 80% of all deaths from esophageal cancer are attributable to cigarette smoking. Smokers have an 8- to 10-fold greater risk of developing esophageal cancer than nonsmokers. Smoking is a major cause of oral cancer (tongue, cheeks, lips, gums), accounting for 92% of these cancers in men and 61% in women. The increased risk attributed to smoking is of 27-fold in men and 6-fold in women. As with laryngeal cancer, alcohol consumption significantly increases the risk of oral cancer. Close to 50% of all bladder and kidney cancer deaths in men are caused by smoking. Among women, 37% of bladder and 12% of kidney cancer deaths are directly attributable to smoking. The risk of developing these cancers is two to three times greater for both male and female smokers than that of the nonsmoking population. Cigarette smoke can interact with chemicals (especially aromatic amines) in the work place to produce bladder and kidney cancer. Workers exposed to organic chemicals in the dye, rubber, leather and paint industries that also smoke have a greater bladder cancer rate than would be predicted from either smoking or chemicals alone. Smoking is a risk factor for non-melanoma skin cancer. Cigarette smoking accounts for approximately 30% of cervical cancers deaths in the USA, with women smokers having a two-fold increase in the incidence of this disease over never-smokers. Cessation appears to have an immediate effect, with former smokers having no increased risk of developing cervical cancer. A 9-year prospective study of over 6,000 women found a dose-response relationship between smoking cigarettes and the risk of cervical cancer. Those who smoked 15 or more cigarettes per day were 80% more likely to develop cancer or precancerous lesions than nonsmokers. Those who smoked for 10 or more years were 80% more likely to develop cancer. Starting smoking younger than age 16 produced twice the risk of nonsmokers for developing cervical pathology. Smoking is one co-factor that makes HPV-infected cells more likely to turn cancerous. Cigarette smoke contains a large number of carcinogens and therefore it should come as no surprise that cigarette smoking is one of the biggest risk factors for developing pancreatic cancer. For example, smoking during college has been associated with a 2 to 3-fold increased risk of pancreatic cancer. Approximately 30% of all deaths from pancreatic cancer are attributable to cigarette smoking. Historically, males have had a much higher incidence of cancer of the pancreas. However, this difference is steadily decreasing as women smoke earlier and more heavily. There is approximately a 2-fold increase in the risk of developing pancreatic cancer with smoking and this risk is dose-dependent. About 20% of the mortality from stomach cancer is attributable to smoking. There is approximately a 50% increase in the risk of stomach cancer in smokers compared to never-smokers. One study has found that, compared to men who had never smoked, men who had smoked had an elevated mortality rate for non-Hodgkin's, with a risk almost four-fold greater among the heaviest smokers. Cigarette smokers have total, overall cancer death rates twice that of nonsmokers. The greater the number of cigarettes smoked, the greater the risk. There is irrefutable evidence linking cigarette smoking and cancer of various sites. The urine of cigarette smokers has been found to be strongly mutagenic in bacterial test systems. There are at least 43 carcinogens described in cigarette smoke which include polyaromatic hydrocarbons, heterocyclic hydrocarbons, N-nitrosamines, aromatic amines, aldehydes, volatile carcinogens, inorganic compounds, and radioactive elements. Cigarette smoke contains substances that act at every stage of cancer formation and growth. Organs that have direct contact with smoke (lung, oral cavity and esophagus) are at the greatest risk of developing cancer. As the substances delivered in cigarette smoke are absorbed and spread through the human body, smoking causes cancer at various distant sites. For example, cigarette smoking is a risk factor for the development of cervical cancer. Samples from the cervix of women smokers show components of tobacco smoke that contain mutagenic activity. In terms of health risks, puffing on a cigar but not inhaling is roughly the equivalent of smoking two cigarettes. Inhaling boosts the exposure to the equivalent of as many as four cigarettes. As with skin that is overexposed to sunlight, smoking causes thickening and fragmentation of elastin, the elastic fibers that are long and smooth in healthy skin. Smoking also depletes the skin's oxygen supply by reducing circulation. It decreases the formation of collagen, the skin's main structural component, and may reduce the water content of the skin, all of which increase wrinkling. Sometimes it is easy to spot someone with 'smoker's face'. NAC is a beneficial nutrient for the lungs both during and after cessation of smoking. Most people are amazed at how easy it is to quit smoking while fasting. Fasting makes it easier to overcome a tobacco addiction by reducing the craving for nicotine. Smokers are advised to consume an extra 35mg daily because smoking depletes the body of some vitamin C.